↑ "The Thirty-Years-War". Western New England College. สืบค้นเมื่อ 2008-05-24. ↑ "::The Thirty Years War 1621 to 1626:". www.historylearningsite.co.uk. สืบค้นเมื่อ 2008-05-22. ↑ "Thirty Years War — Infoplease.com". www.infoplease.com. สืบค้นเมื่อ 2008-05-24. ↑ "Thirty Years' War". Encyclopædia Britannica. สืบค้นเมื่อ 2008-05-24. ↑ Richard W. Rahn (2006-12-21). "Avoiding a Thirty Years War". The Washington Post. www.discovery.org. สืบค้นเมื่อ 2008-05-25. ↑ "Diets of Speyer (German history) – Britannica Online Encyclopedia". britannica.com. สืบค้นเมื่อ 24 May 2008. ↑ "::The Peace of Prague::". historylearningsite.co.uk. สืบค้นเมื่อ 24 May 2008. ↑ "The Thirty Years War". Pipeline. สืบค้นเมื่อ 24 May 2008. ↑ "Frederick the Winter King. The Columbia Encyclopedia, Sixth Edition. 2001–07". bartleby.com. สืบค้นเมื่อ 24 May 2008. ↑ 19.0 19.1 19.2 19.3 C. V. Wedgwood, The Thirty Years War (Penguin, 1957, 1961), p. 48. ↑ 20.0 20.1 C. V. Wedgwood, The Thirty Years War (Penguin, 1957, 1961), p. 50. 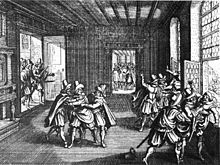 ↑ "The Defenestration of Prague « Criticality". steveedney.wordpress.com. สืบค้นเมื่อ 25 May 2008. ↑ "Bohemian Revolt-30 Years War". Thirty Years War. สืบค้นเมื่อ 25 May 2008. ↑ "Wars of the Western Civilization". visualstatistics.net. สืบค้นเมื่อ 24 May 2008. หน้านี้แก้ไขล่าสุดเมื่อวันที่ 26 มกราคม 2562 เวลา 11:37 น.